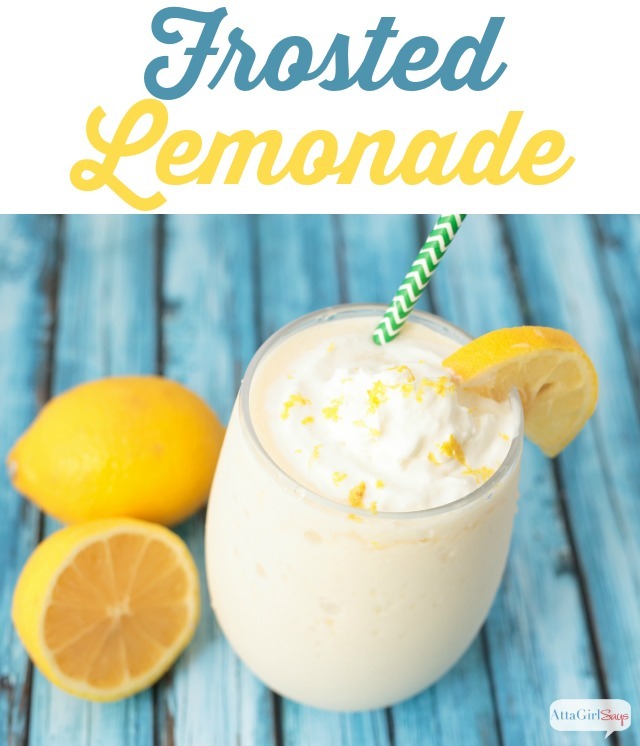 Looking for a refreshing and delicious dessert to serve this summer? 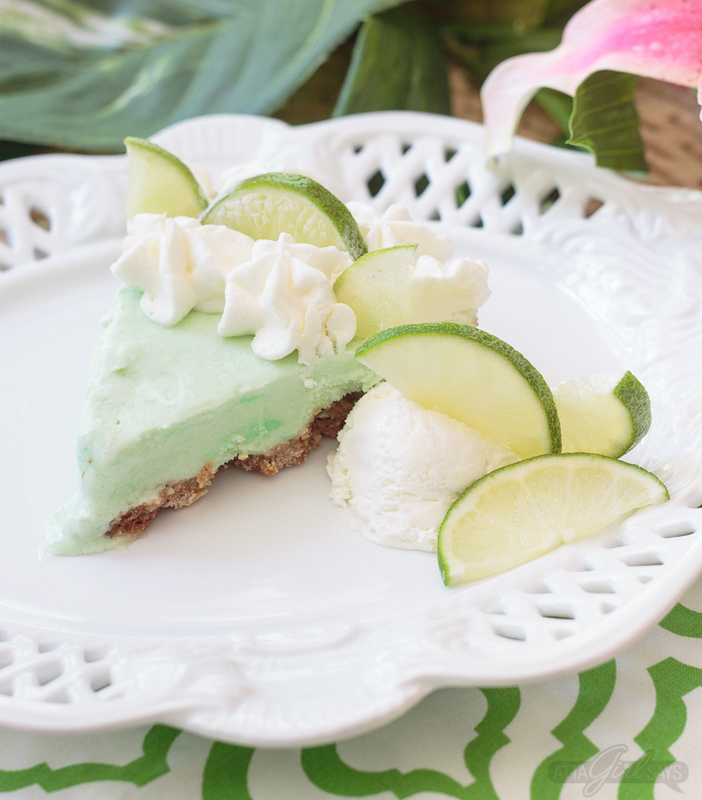 Try this frozen margarita pie with a salted coconut graham cracker crust. It’s made with ice cream, lime sherbet and margarita mix. If you like, add a shot of tequila to make an adults-only version. Have you ever been to a progressive dinner party? It’s a fun way to entertain without having to take on all the work of hosting an entire dinner party on your own. A progressive dinner works this way: You start out at one house for cocktails or appetizers, then move along to a different location for each course. 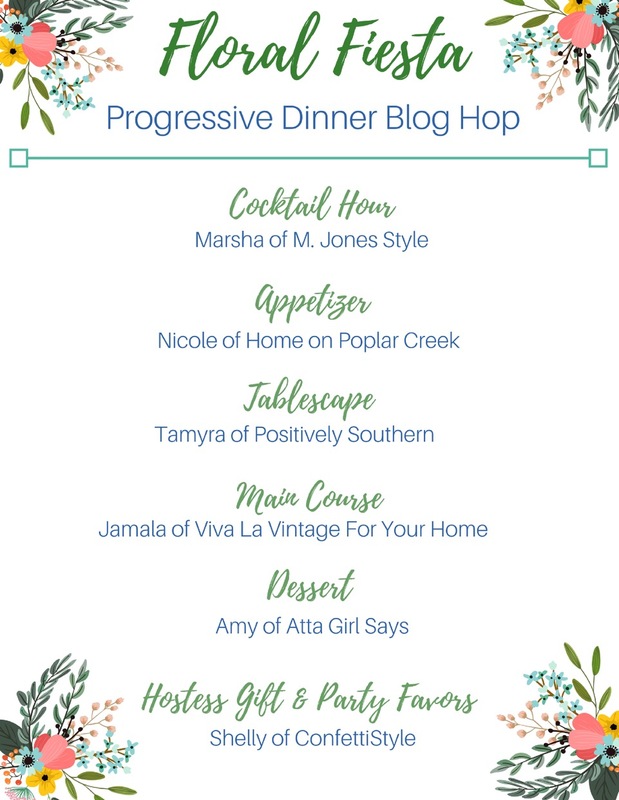 My friend Shelly from ConfettiStyle invited a group of us to participate in a virtual progressive dinner, with each blogger responsible for a different aspect of the party menu or decor. I’m in charge of dessert for our Floral Fiesta Spring Soiree. 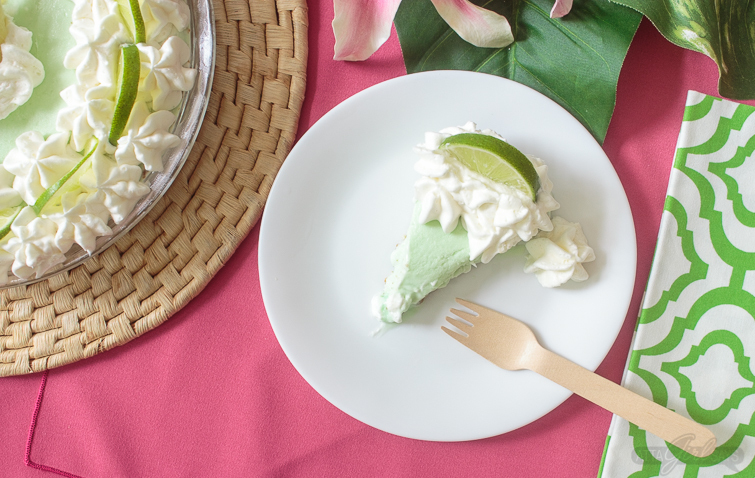 For our virtual get-together, I decided to make a frozen margarita pie — one of my favorite summertime desserts. 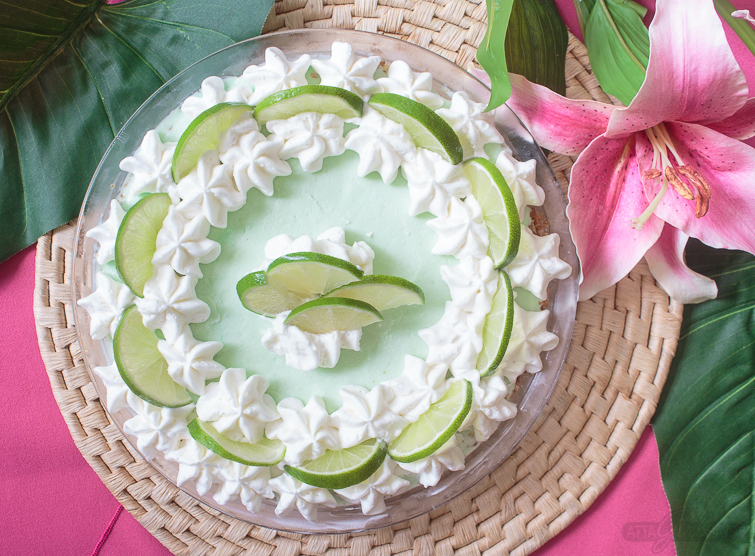 This ice cream margarita pie looks pretty, and it tastes really good, too. 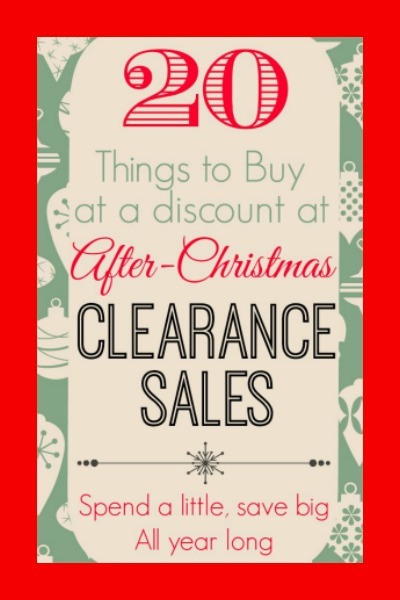 If you’re visiting here from Viva La Vintage for Your Home, the last stop on the progressive dinner, welcome! I’m really excited to try Jamala’s entree recipe. How about you? Be sure you visit all the stops on the soiree for more recipes, decorating and craft ideas so you can host your own IRL Floral Fiesta. You’ll find links to all the participants at the end of this post. 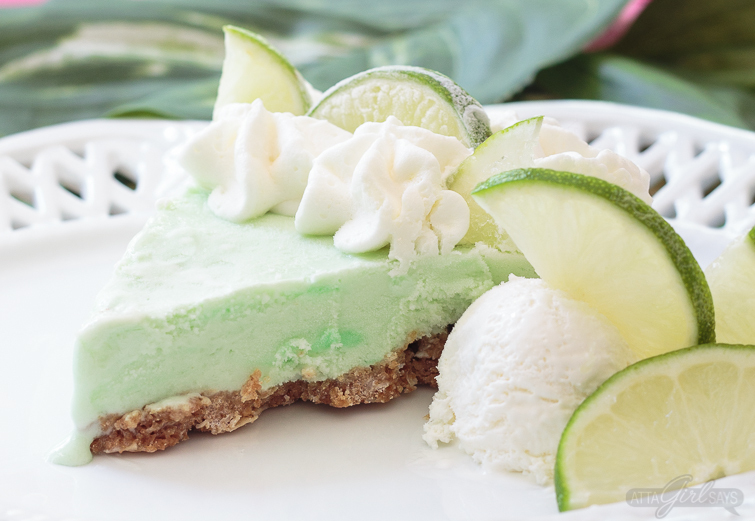 I know you’re dying to slice into the margarita pie, and I don’t blame you one bit. It’s sweet, salty and refreshing — just like a margarita. This dessert takes almost no effort to put together, although you will need to allow time for the ice cream and sherbet filling to freeze. 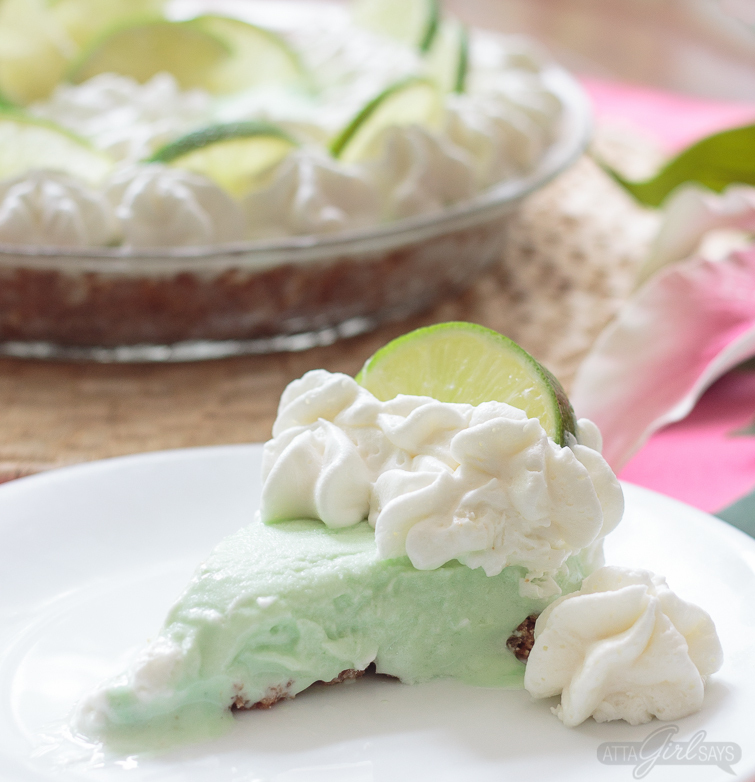 I recommend making the frozen margarita pie the day before you plan to serve it. 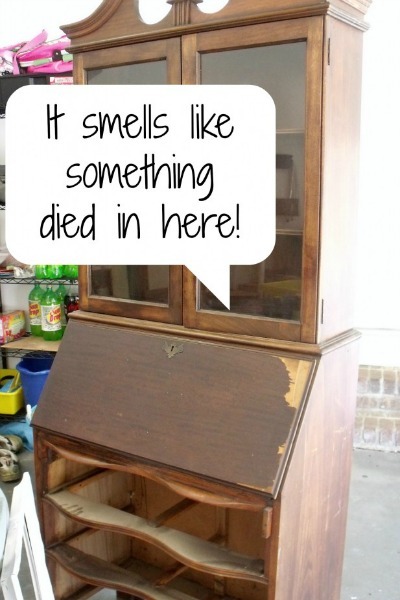 Freeze it overnight, then decorate it the next morning. Pop it back into the freezer until you’re ready to serve it. And while you could technically use a store-bought graham cracker crust to save some time, you’ll be missing out on the best part of the pie, in my opinion. 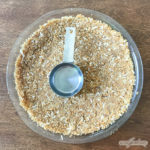 The buttery, salted coconut graham cracker crust is the stuff of dreams! And it’s not hard to make at all. 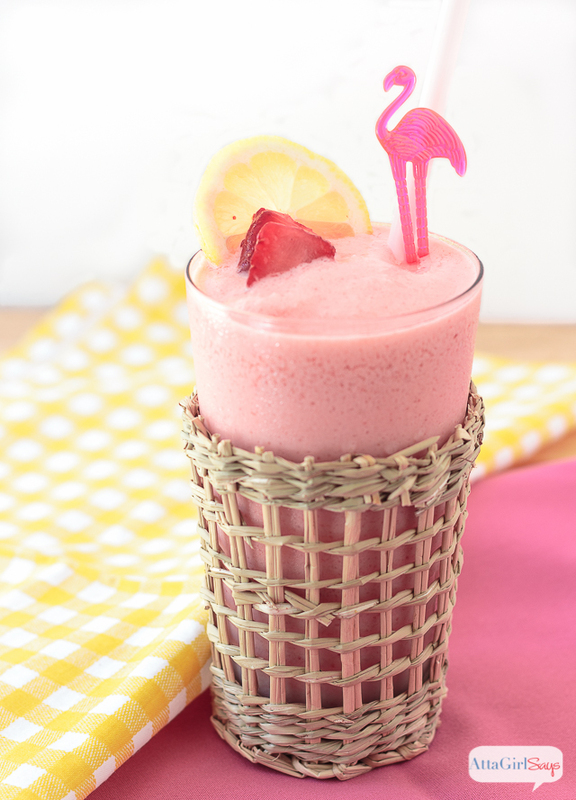 Looking for a refreshing and delicious dessert to serve this summer? 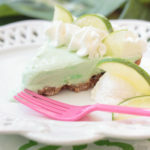 Try this frozen margarita pie with a salted coconut graham cracker crust. It's made with ice cream, lime sherbet and margarita mix. If you like, add a shot of tequila to make an adults-only version. 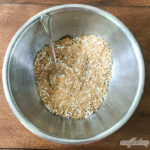 To make the crust, combine the graham cracker crumbs, sugar, unsweetened coconut flakes and salt in a bowl. Mix well. Pour melted butter over the mixture and stir until moistened. Press the crust into the bottom and sides an 8-inch pie pan. Bake at 350 degrees for 8 minutes, then allow to cool completely before filling. In a separate bowl, combine the lime sherbet with tequila, if desired. Stir until fully incorporated. If the sherbet and ice cream mixtures are too soft, return to the freezer until almost firm. 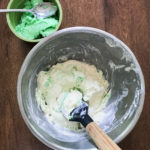 Fold the lime sherbet into the ice cream mixture until fully incorporated. 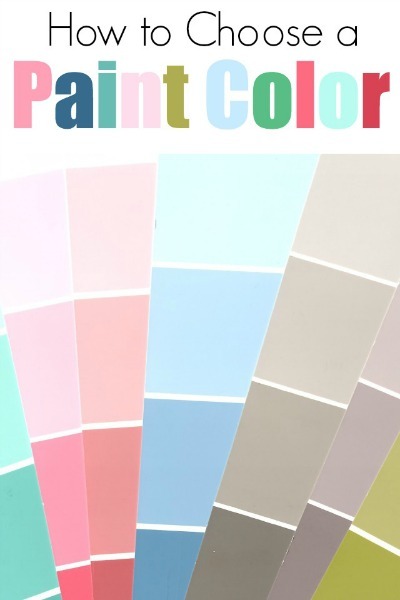 The mixture should be a pale green color. If the mixture is too soft, again return it to the freezer until it is nearly firm. Spread the ice cream mixture into the pie crust, smoothing with an offset spatula. Return the assembled pie to the freezer for at least 8 hours, or overnight. Prepare the Dream Whip, according to the package directions, and pipe the whipped cream onto the pie. Garnish with lime slices. Return the decorated pie to the freezer until ready to serve. If you prefer a saltier crust, increase the amount of salt to 3/4 teaspoon. You can also increase the amount of margarita mix used in the pie to 1/2 cup, if preferred. If you're making the adults-only version of the pie, you can add tequila and Cointreau or triple sec to the whipped cream. I wouldn't add more than 2 Tablespoons of liquor to the whipped topping. I used powdered Dream Whip, prepared according to the package directions, to top this margarita pie. 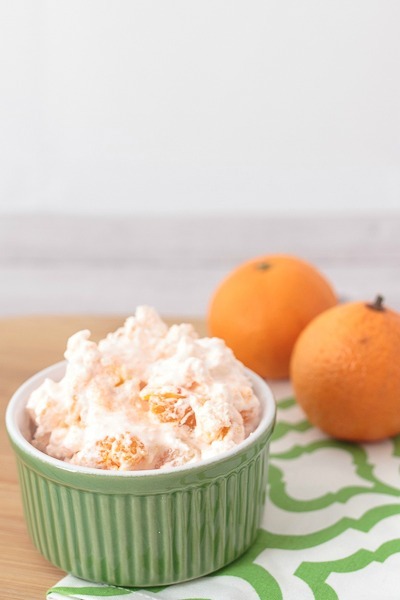 But you can use homemade whipped cream, the canned stuff or even Cool Whip. If you’re making the adults-only version of this pie, feel free to add a few tablespoons of tequila to the whipped cream for an added kick. 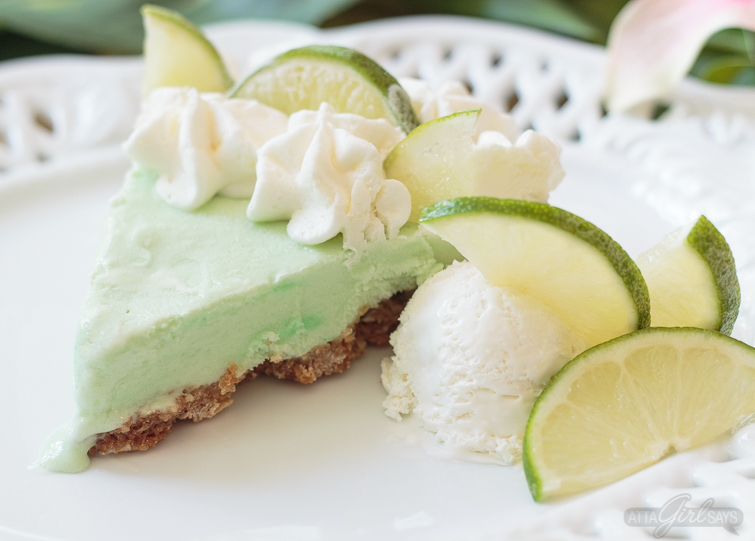 Just a few minutes before you’re ready to serve the margarita pie, take it out of the freezer and let it set on the counter for about five minutes. Slice with a sharp knife and serve immediately. I’ve found the pie is easier to cut and serve when it’s more frozen. Guests can eat it immediately or let the ice cream melt a bit, if preferred. Now that we’re done with dessert, it’s time to head over to ConfettiStyle, where Shelly is sharing some fabulous ideas for hostess gifts and party favors. 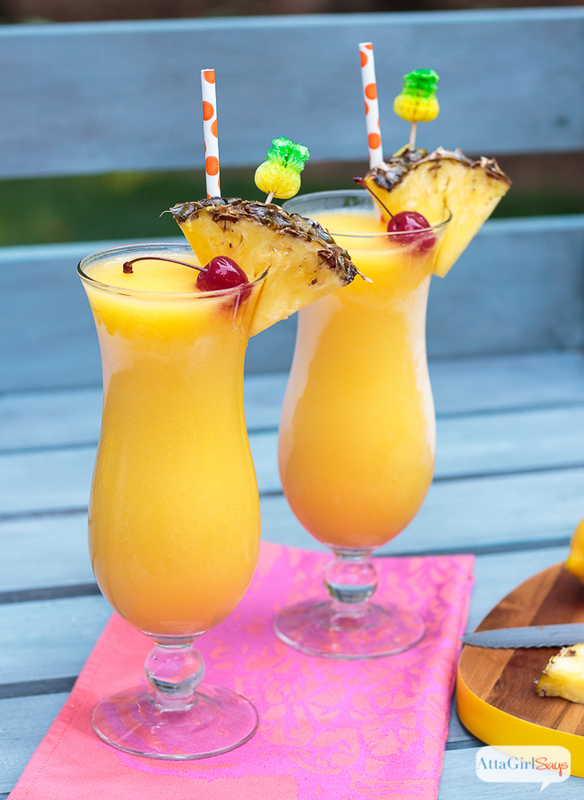 You might enjoy these other frozen summertime treats. 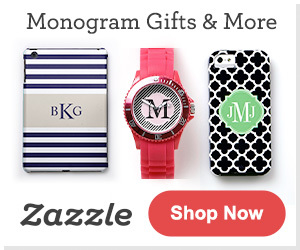 You had me at Margarita! This looks divine! Lovely, light, luscious way to top of a meal and bring a progressive dinner to a sweet close! 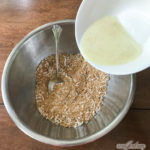 I always make my graham crust from scratch (the store bought ones just don’t compare!) but never considered adding coconut flakes for a different flavor. The coconut is such a nice addition to this particular pie crust. And the salt, too! Definitely give it a try; I don’t think you’ll be disappointed. Oh my!!! This looks DELICIOUS!! I really can’t wait to give this a try! Amy, this pie looks so refreshing and too die for! You are right, it’s all about the homemade buttery graham crust and I can’t wait to whip up one of these fluffy boys soon. Thanks for sharing. Amy, you had me at Margarita or was it pie and tequilla. 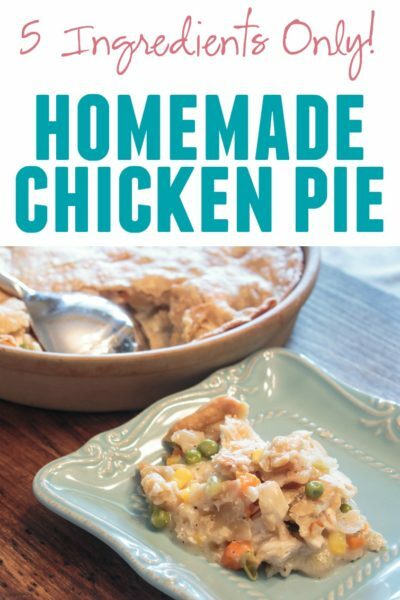 After enjoying Jamala’s chicken dinner, I can’t think of a more refreshing dessert than your pie. It almost looks too good to each but rest assured I would enjoy a piece (or two) for dessert. Thanks for inspiring me with such a yummy recipe. This dessert has sunny spring delight written all over it.. it looks too pretty to even cut into it.. but I’m sure it’s just as delicious as it looks! Thanks for sharing such goodness!